Our school is run by Scot & Katie Norris. 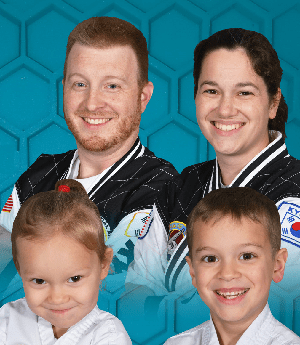 The Norris family believes that martial arts is about more than just self-defense. Martial arts is a lifestyle and a road to a better, more balanced, healthier, and fitter way of life. 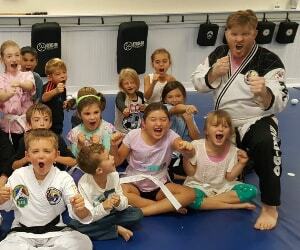 AKF Martial Arts in Crystal Lake offers programs for kids ages 7 and up and pre-school kids ages 3 to 4 and 5 to 6. Choose a program below that most interests you and click the blue button it to learn more about program, schedule, and current web specials available. Have questions? feel free to give us a call at 815-455-3888. We look forward to speaking with you soon! Mr. Scot Norris has been training in the Martial Arts since the age of 12. He has been training for 25 years and has been teaching for over 13. 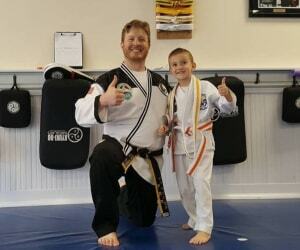 Scot is working towards earning his 5th Dan Masters rank in Kyuki-do Martial Arts in 2019. Mrs. Katie Norris has been training in Martial Arts since the age of 15. She has been training for 18 years and has been teaching for over 11. 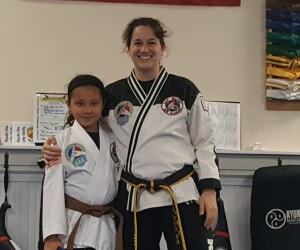 Katie earned her 4th Dan Jr. Masters rank in Kyuki-do Martial Arts in 2017. Our Crystal Lake kids martial arts classes do more than teach self defense. Children learn discipline, self-awareness, respect, coordination, goal setting, and much more! Ask about our web specials.